Discussion in 'Mac Programming' started by Resister, Apr 23, 2012. It's just a bunch of Slider controls. 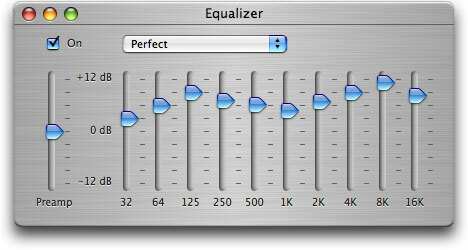 The audio 'brains' behind what an EQ actually does are probably complicated. Yeah, I'm just wanting to know if anyone has any code for the "brains" of it. I've read that Apple's AudioUnits would need to be used, but thats a bit above me. A digital equaliser requires some rather complex maths, FFTs, manipulating the frequencies, transforming back, doing everything very carefully to avoid audible glitches, so I think going through the documentation for audio units is your best chance. BTW. If you find something in there that allows changing playback speed without changing pitch I would be interested in hearing about that, just out of curiosity. You might want to search for free open software doing audio editing. Reading the source code might help in understanding how the algorithms work. You might also have a starting point for experiments. Core Audio on Mac OS X includes the AUTimePitch Audio Unit. On iOS, Dirac reportedly sells a commercial time pitch library.